You never know what you’re going to be up against when you work in law enforcement which is why having a pair of top law enforcement boots is key. It can be hard to figure out which ones are worth it which is why we researched some of the top-selling brands and best-rated boots available and put together this guide. Before we get started, let’s take a look at some of the key things to keep in mind. Material: Most of these boots are made out of a combination of leather with nylon or textile fabric panels. The leather is primarily for durability while the fabric allows your foot and ankle to breathe for added comfort. Color Options: All of these boots are available in black since it’s the most popular choice for boots in this style. You’ll also find light brown boots and a few dark brown options that have a real military feel. 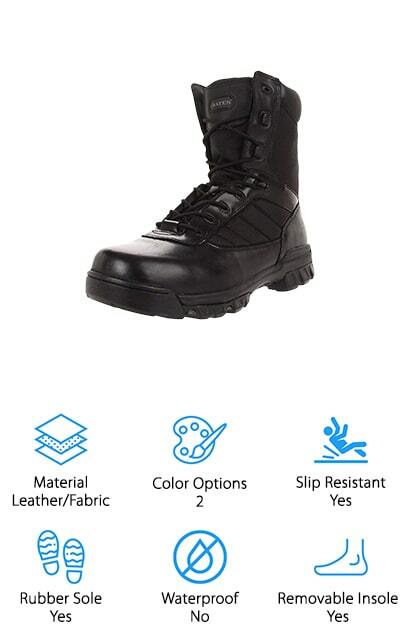 Slip Resistant: If you work in an area where it rains or snows a lot, slip-resistant boots are essential. 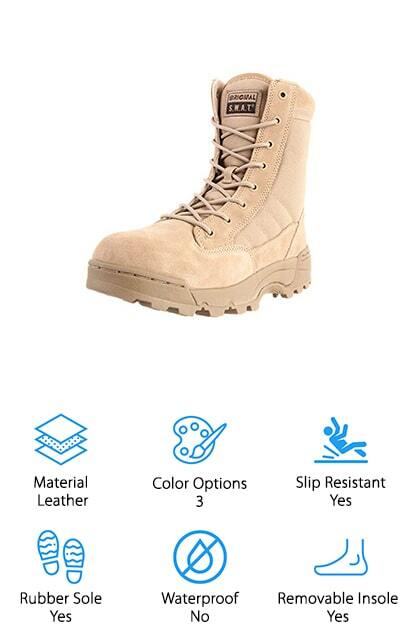 They help you stay safely on your feet and let you perform effectively no matter what terrain you’re working on. Rubber Sole: A good rubber sole will not only help provide traction and grip but also a lot of strength and support as well as a little bit of bounce. There are other great materials, too, but rubber it the gold standard. Waterproof: Some of these boots are waterproof, some are not. It’s not really essential unless you work somewhere that’s wet most of the time. Waterproofing often comes at the cost of breathability so you’ll have to decide what’s best for your situation. Removable Insole: Most of these insoles are great but if you have an aftermarket insert you like or if you need special orthotic insoles, look for a boot with removable insoles to make the process quick and easy. Now that you know what to look for, let’s get right into our reviews. Here’s how it works. We put our top and budget picks right at the top of the list. This is the best way to see the range that’s available and, this way, you’ll be sure to see them even if you’re in a hurry. 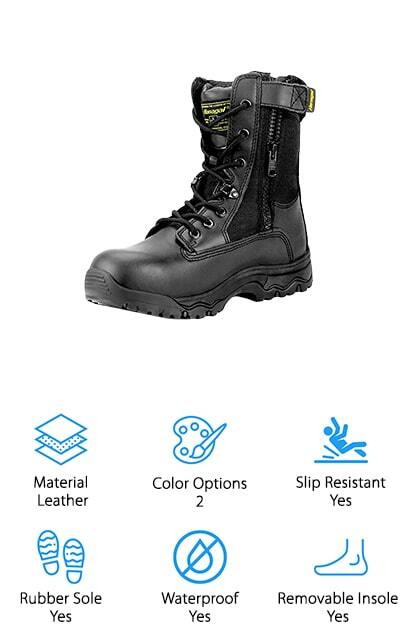 Stay tuned if you can, whether you’re looking for waterproof or lightweight law enforcement boots, you’ll find a lot of great options here. Our top pick is the Bates Tactical Sport Boot. It features a leather and fabric upper with a shaft that comes up to about mid-calf. The combination of the 2 materials provides a lot of support while still allowing your feet to breathe. A lace-up vamp lets you adjust how tight the fit is so you always feel comfortable and secure in your boots. Inside, there’s moisture-wicking lining to keep you dry and a full cushion EVA midsole for comfort and support. That’s not all, there’s also a really comfortable cushioned insert that’s removable just in case you want to use your favorite tried and true aftermarket insert. 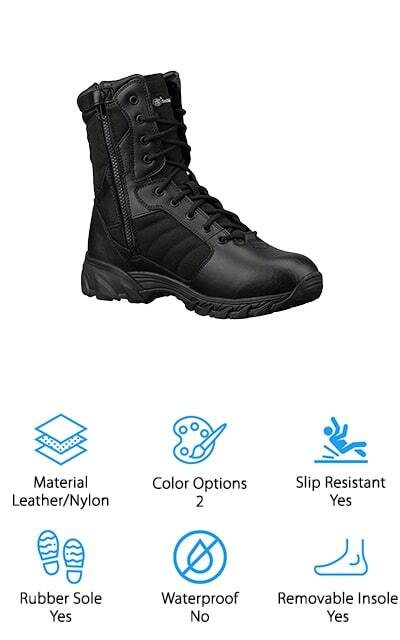 These boots feature a flexible, oil and slip-resistant rubber outsole and are lightweight and comfortable even when you’re pulling a double shift. For a quality pair of cheap law enforcement boots, you can’t do much better than our budget pick, the Maelstrom LANDSHIP Tactical Boot. They have a bit of an athletic look to them thanks to the highly breathable mesh upper and rugged outsole. Because the outsole is also slip-resistant on most surfaces, this is a great choice for a variety of outdoor terrain. It also has anti-fatigue technology, which uses a removable cushion insole and lightweight EVA midsole to absorb the impact from hard surfaces plus the padded tongue and collar help with all-day support and comfort. There’s also moisture-wicking lining to keep your feet cool and dry. One more nice thing about these boots is that the leather is polishable so you can always keep them looking good as new. 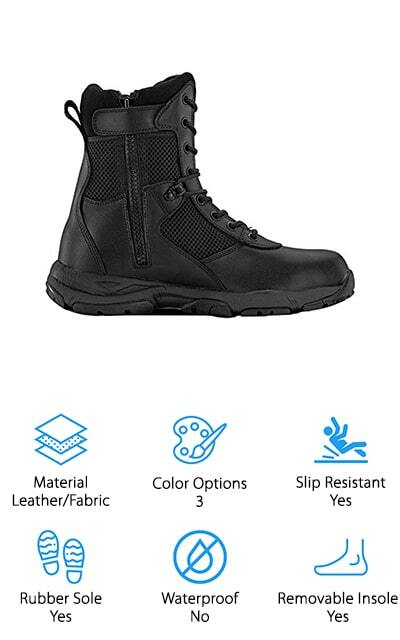 Another reliable pair of waterproof law enforcement boots is the Smith & Wesson 2.0 Tactical Boots. These boots have a tough leather and nylon upper that comes to about mid-calf and gives you full protection and support. A gusseted tongue keeps dirt and debris from getting inside the boot and the lace-up front lets you adjust the fit so it’s snug and secure. Not only is there an EVA midsole that provides cradled support, but they also used a steel shank to give you just a little bit more. That’s not all, torsional rigidity also helps reduce foot fatigue even after long, intense shifts. As for the outsole, it’s slip resistant and is just as good on dirt and ladders as it in on concrete and waxed floors. Next up is the 5.11 Tactical A.T.A.C. Boot. This is a tough boot that was designed for comfort, protection, and utility. The leather and fabric upper sits just below mid-calf and features 1200-denier Cordura nylon side panels for flexible support. An inside zipper helps get them off and on easily while the front laces let you tighten them as much as you need to for a secure fit. Inside, the anti-bacterial Drilex lining helps fight foot odors. They have a really comfortable fit right out of the box but you can remove the insole if needed. In fact, they don’t really need any break in time at all. The slip-resistant sole keeps you on your feet across different terrain and the waterproofing is really effective. 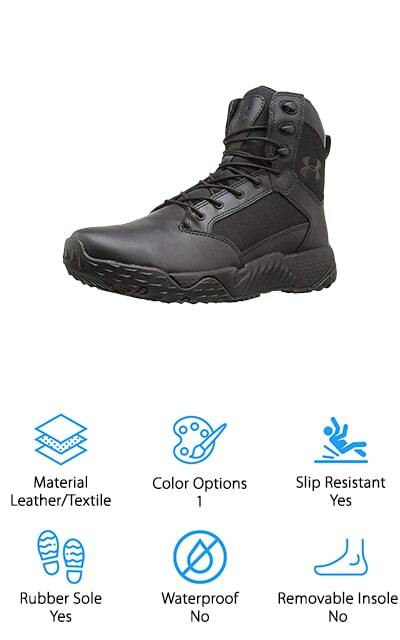 For a great pair of Under Armour law enforcement boots, check out the Stellar Tac. The leather and textile upper comes just about to the top of the ankle and has a pull on loop so you can get into them quickly. While this boot isn’t waterproof, it does have a quick-dry design as well as anti-odor technology to prevent the growth of microbes that love a warm, moist environment. A molded EVA midsole is reinforced with a TPU shank for superior support and protection. That’s not all, the low-profile rubber sole is slip resistant and provides a good grip that can take you from the dirt to a waxed floor. Most of the toe and foot of this boot are made of leather which is polishable so you can keep them looking neat and tidy. Our next pick is the Rocky Duty Alpha Force Boot. The thing that stands out the most about this boot is the rubber sole. It’s oil and slip resistant and has large, chunky lugs that help you stay on your feet and provide proper support. Not only is the outside of this boot waterproof, but there’s also an inner waterproof membrane. The entire length of the boot is covered for complete protection against rain, snow, or streams. Waterproofing is guaranteed for 6 months and then must be maintained using a waterproofing spray. Inside, the Black Airport Footbed has an addition non-metallic stabilizer for the support you need to make it through a shift without any leg or back pain. A lace-up front and padded collar make sure you get the right fit while staying comfortable. 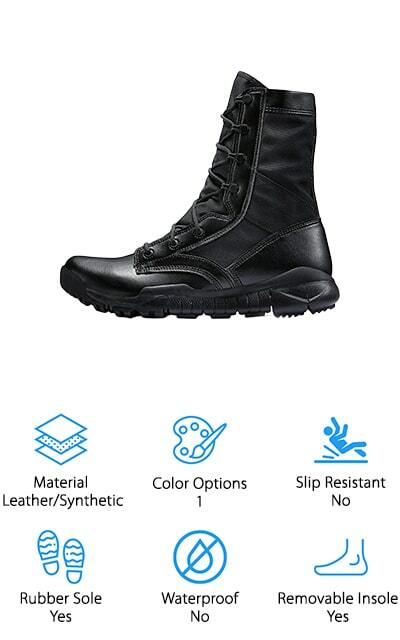 You know that NIKE makes great athletic shoes, but did you they also make one of the top-rated law enforcement boots? The NIKE Special Field Police Boots feature a dynamic lacing system and an 8-inch shaft that comes about mid-calf. It’s easy to tighten them so you get the right amount of security and support. The uppers are made of leather and canvas that are tough enough to last while also allowing your foot to breathe. Inside, a Phylon midsole and lightweight cushioning give you the support you need while the internal rock shield offers puncture protection and helps absorb and disperse some pressure. As for the rubber outsole, it has a really aggressive tread pattern that helps with multi-surface grip. Plus, the leather parts of these NIKE law enforcement boots can be polished. The Original S.W.A.T. Tactical Boot is next on our list and it’s a classic design that’s made for the people who put their lives on the line. The upper is made of Denier nylon and full grain leather to give you the best balance of strength and comfort. Stitched heels and toes help to extend the life of the boot and a custom-molded thermoplastic heel counter and toe box provide both comfort and lateral support. 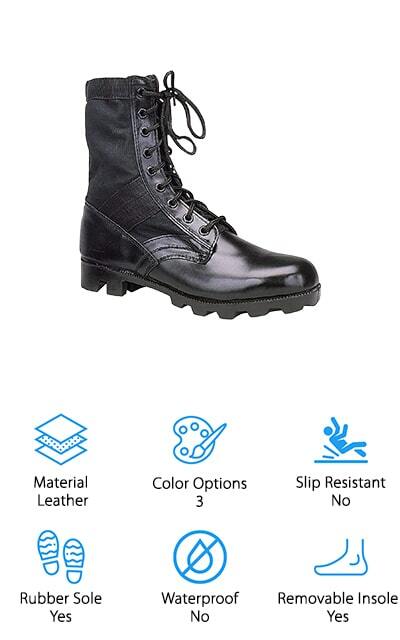 An EVA midsole keeps these boots lightweight and provides the support you need to make it through a shift without any foot pain. The heel and toe are polishable and all of the hardware is rust proof to keep these boots looking professional at all times. Plus, they’re available in 3 different colors. Next up are the Hanagal Escalade Tactical Boots. These durable, lightweight boots have a suede leather upper with breathable mesh panels to help air circulate through. A 6-inch side zipper makes getting them off and on really easy and the tie-up front lets you adjust the fit as snug as you like. A slip-resistant rubber sole keeps you on your feet in any type of terrain and, since they’re waterproof, you don’t have to worry about rain or snow holding you back, either. There’s more, each boot has a small pocket on the outside, the perfect place to put a lighter, some cash, or clip on a small flashlight. These boots come with a 100% satisfaction guarantee and a 30-day hassle free return policy. They come in 2 colors, black, and sand. Last up is the Rotchco GI Jungle Boot, a great choice for working in really hot weather. The upper is made of canvas and nylon with leather trim which lets your foot breathe much more than solid leather uppers. A tie-up front lets you tighten the laces for a snug fit and the eyelets are made of aluminum so they won’t rust or wear easily. The thing that really stands out about these boots is the sole. The thick, chunky tread is great for muddy terrain and it’s vulcanized to the boot so it’s not going to separate or fall apart easily. One thing we should point out about these boots is that they run large so order down at least 1 size. They’re available in 3 different colors, too: black, desert tan, and olive drab.